The Sun River Project is composed of the Greenfields and Fort Shaw Divisions in central Montana, west of the city of Great Falls. Principal features are Gibson Dam and Reservoir, Willow Creek Dam and Reservoir, Pishkun Dikes and Reservoir, Sun River Diversion Dam, Fort Shaw Diversion Dam, two supply canals, and six irrigation canals. The project uses the waters of the Sun River and tributaries, stored and regulated by Gibson, Pishkun, and Willow Creek Reservoirs, for irrigating over 93,000 acres of land lying along the Sun River. Water stored in Gibson Reservoir is released into the river for diversion downstream into the Pishkun Supply Canal, heading at Sun River Diversion Dam, conveys water to Pishkun Reservoir or to the Willow Creek Reservoir through the Willow Creek Feeder Canal, which stems from the Pishkun Supply Canal and empties into a natural channel to the reservoir. Water released from Pishkun Reservoir enters the Sun River Slope Canal, which branches into several main canals for distribution to 82,230 acres in the Greenfields Division. 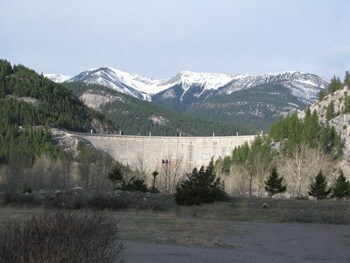 Storage in Willow Creek Reservoir is returned to the Sun River. Water for approximately 10,000 acres in the Fort Shaw Division is diverted directly from the river into the Fort Shaw Canal. GID serves between 500-600 water users annually. Boots & Shovels is a book describing the History of Greenfields Irrigation District, as well as pictures and information on all the families that played a role in homesteading the area. Get your very own copy for just $60. Read the article by Judith Fabry. Download the PDF.